There are many “styles” of Karate. Some, like many Korean styles, emphasize long-range kicking. Others, like Chinese Kung Fu (the “original Karate”), emphasize circular movements and fighting methods modeled after animal behaviors. Aikido and Jujitsu use leverage and joint locks to manipulate aggressors. Japanese Karate styles are often closely linked with Japanese Shotokan Karate with a short forward stance and strong punches, kicks, and blocks. 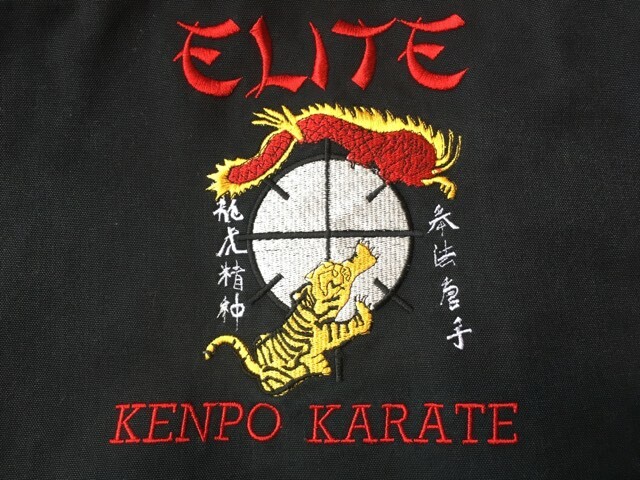 Our style, Kenpo, emphasizes “closing the gap” and in-fighting, with many short-range punches, kicks, and elbow strikes. Another unique facet of our Hawaiian Kenpo style is the incorporation of Judo, Jujitsu, and Aikido techniques (Grandmaster Bill Ryusaki also holds a 7th degree black belt in Judo). Karate is a martial art. “Martial” comes from the Latin martialis, meaning “pertaining to Mars”, the ancient Roman god of war. Obviously, when training people in potentially deadly techniques, a great deal of control must be exercised over students to prevent injuries. The person who both teaches and watches over us is our Sensei (pronounced “SEN-say”), a Japanese word meaning “teacher”. To become a Sensei, one must first be promoted to the rank of black belt. Partly because of the subject matter, and partly due to the traditions passed down to us from its Japanese heritage, Karate requires strict obedience, careful attention, and respect for the instructor. The teacher, or Sensei, may dismiss anyone from activities at any time if he or she feels that that individual is creating a disturbance or otherwise endangering the safety of themselves or of other students. If you or your child are students in our dojo, please take a few minutes to go over the “RULES OF THE DOJO”. While some regulations may seem strict when compared with your previous experiences, please remember that the ultimate outcome of following the rules is ensuring everyone’s safety and enjoyment of the classes. Please be aware that there are MANY versions of the history of Karate. You will find other variations and even completely different histories from other sources. The following was worked out of multiple text and internet references, and is as accurate as I can make it. Just don’t be shocked if you hear something different from other Karate practitioners - after all, very few things were written down before this century. Unfortunately, as in many area of highly specialized training, Karate is not strictly a sea of brotherly love. Some beginning students like to believe that somehow the local martial arts method that they have taken up is "better" than any other style. On television, you may watch expert proponents of divergent styles fight it out for prizes and recognition. You may even hear some karateists theorize that their system is innately superior to all others, and that their way of doing Karate is somehow the only correct method, or that other schools do not practice "true Karate". In our dojo, Sensei Carlos encourages the participation of students and Senseis from any and all styles. Sensei Bill Ryusaki was born in Kamuela on the big island of Hawaii. Sensei Bill’s father, Torazo Ryusaki, held black belts in both Judo and Shotokan Karate, and required all his seven sons (he also had four daughters) to train in two martial arts. At the age of 8, Bill Ryusaki began training in Judo. While his brothers chose Kendo (Japanese sword fighting) and Aikido, Bill selected Judo and Kenpo Karate, and was taught by William Chow and Sonny Emperado, students of James Mitose. In the late 50’s, Sensei Bill came to southern California, and worked with Ed Parker. In 1962 he opened the original Ryu-Dojo in North Hollywood, but moved his studio to his home in Van Nuys in 1979. Sensei Bill became a frequent “guest Sensei” in the Racquetball World Kenpo Karate class over the last eight years. In July 1994, with his former student Sensei Otto Estuardo Schumann leaving for Guatemala, Sensei Bill took over his well established Kenpo Karate school at Racquetball World. Recently, Sensei Bill decided to leave Racquetball World and start a new Ryu Dojo school in Chatsworth. Sensei Bill is a regular guest Sensei in the world famous House of Champions located in California..
Grandmaster (GM) Bill Ryusaki is one of the true pioneers of Kenpo in the United States. After coming to the mainland in the late 1950's, he started training with Ed Parker in his garage. He also trained with Ed Tabian, a student of Ed Parker's. He then trained with John Leoning (a black belt under Adriano D. Emperado), the first Kajukenbo instructor on the mainland, in 1957. GM Bill Ryusaki received his black belt in Kajukenbo/Kenpo from John Leoning in 1961. 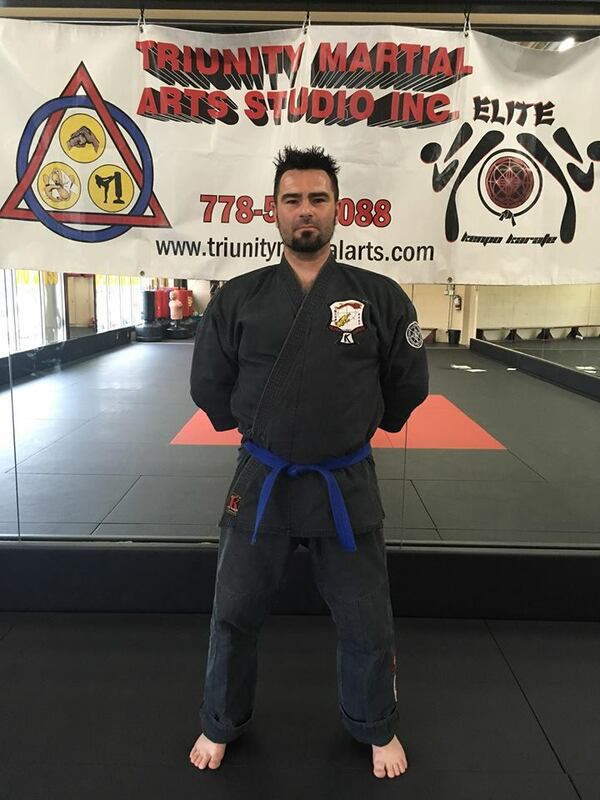 Sensei Bill's first black belt was Dan Guzman. In 1988 I [Sigung John Bishop] gathered this information from GM Bill Ryusaki, Otto Schumann, Cecil Peoples, Ed Parker and Dan Guzman. They all have copies of my thesis "The History and Evolution of Chinese Kenpo Karate". Although Sijo Emperado told me he never trained GM Ryusaki directly, his student Marino Tiwanak and his instructor William Chow trained GM Ryusaki in Hawaii. GM Ryusaki also trained with Chow's student Bill Chun while in Hawaii. Sensei Bill has appeared in numerous films as an actor and stuntman, including work with Bruce Lee on the “Green Hornet”, and in “Hawaii 5-0”, “Wild, Wild West”, and with David Carradine in “Kung Fu” (remember the assassin sent over from China?). Other credits include “Knots Landing”, “China Beach”, “Planet of the Apes”, “Above the Law” with Steven Seagal, “Rambo - First Blood Part II”, “Karate Kid II”, “Showdown in Little Tokyo”, “Robocop II”, “Police Academy II)”, “Black Rain”, “Double Impact” (where he shot it out with Jean Claude Van Damme), “Welcome to Paradise”, and “Universal Soldier” (one of the men rappelling down the face of the dam was Sensei Bill!). You may also have recognized our Sensei getting his nose punched in by Bridget Fonda in “Point of No Return” (Sensei Jim is the karate student doing the fist-hammer in the same sequence). Sensei Bill has appeared in "Beverly Hills Ninja" with Chris Farley, and he is the co-star of "The Beginner", a short subject film which also features many of our Sensei instructors. Sensei Bill has taught his art to thousands of students, including Senseis Otto Estuardo Schumann, Benny “The Jet” Urquidez, and Cecil Peoples. Being the head of our style, Sensei Bill holds a 10th-degree (Ju-dan) black belt in Hawaiian Kenpo Karate, and a 7th degree black belt in Judo. These classes are more based on the self defense aspects of the American Kenpo Karate therefore are more geared towards sparring. 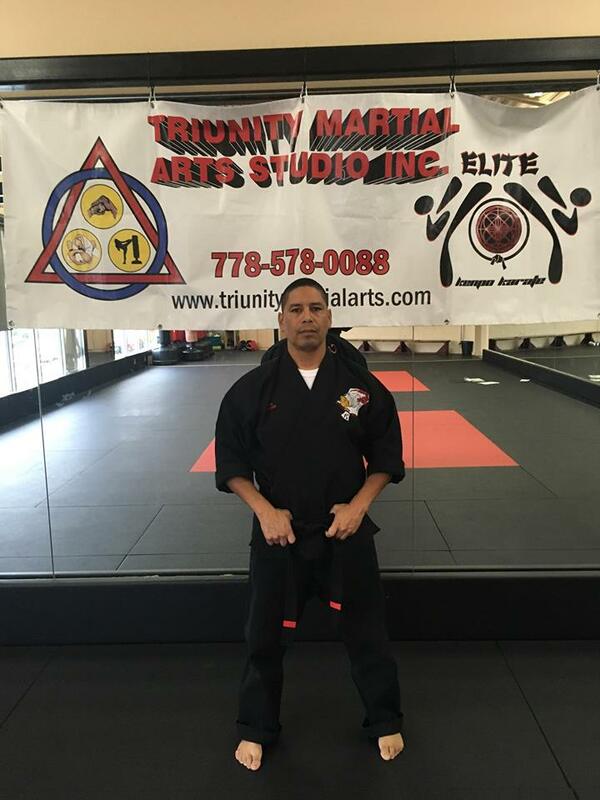 They are taught on Fridays from 6:30-7:30 pm (ages 15 years and up) as well as on Saturdays at 11:00 to 12:30 pm (ages 15 years and up) by none other than our very own Sensei Carlos Cuyun and his assistant instructor our very own Kevin Potgieter. For more inquires regarding these classes and their price packages pls contact Sensei Carlos directly at kenpokaratecanada@hotmail.com.